Document 20: "Race Issue Hits Feminist Party," Boston Herald, 17-18 August 1924. Included in How Did the National Woman's Party Address the Issue of the Enfranchisement of Black Women, 1919-1924?, by Kathryn Kish Sklar and Jill Dias. (Binghamton, NY: State University of New York at Binghamton, 1997). Document 20: "Race Issue Hits Feminist Party," Boston Herald, 17-18 August 1924, National Woman's Party Papers, 1913-1974, Library of Congress (Microfilm (1979), Reel 28). The interconnections of race and gender continued to plague the National Woman's Party after the controversy over the party's February 1921 convention had subsided. No matter how hard NWP leaders tried to focus exclusively on "feminist" issues, they found themselves stumbling over the issue of civil rights for African Americans. A memorial service for suffrage activist Inez Milholland held in August 1924 provided the next major incident revealing the racial insensitivity of party leaders. Inez Milholland had been a prominent suffragist and an equally avid advocate of the rights of working women and African Americans. 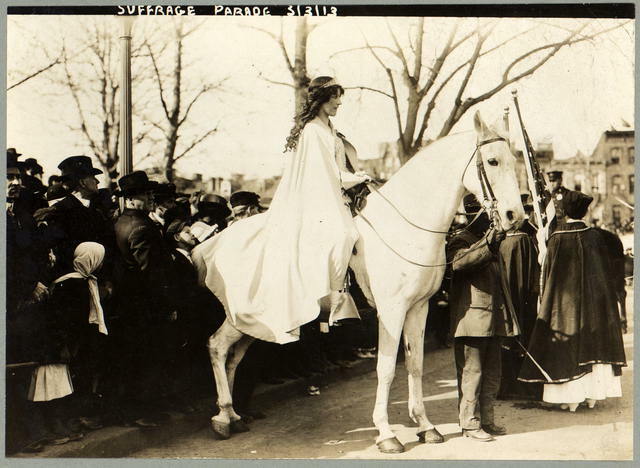 Inez Milholland was a lawyer and feminist who gained national attention by riding a white horse in a major suffrage parade in Washington, D.C. in 1913. Some of the suffragists objected to having Black women march in the parade, but Inez Milholland attempted to secure equal rights for all women regardless of race, and insisted they be included. Leaders in the NAACP believed that Inez Milholland would not have endorsed female candidates who used racist tactics to achieve electoral victory. As the enclosed article from the NWP papers shows, three African American friends of the family attended the memorial service, but were not permitted to speak until Milholland's father broke into the ceremony with a brief, heartfelt speech on the importance of equal rights to his late daughter. The NWP's commitment to the election of women candidates and the "southern strategy" that party leaders adopted to promote women's cause led them to slight African Americans in their ranks and betray an almost century-long tradition linking the causes of women's rights and equal rights for African Americans. "Friends of Inez," he said with obvious emotion, "I am her father and I want to say to you what I had intended to say until now, as I stand here beside her grave. I feel [a] duty to speak out. If I did not think her spirit would rise up from the grave and say to me, 'Dad, why were you afraid.'" "We did not want it to go out," she said, "that we were bringing in the colored people. It would be bad politics. We want to try to elect some women congressmen in the southern states, and after all, this is our convention--not Mr. Milholland's." Back to "What Are Social Movements? A Sociological Perspective"
A. To see a photograph of Inez Milholland in the 1913 suffrage parade, please follow this link to Library of Congress, American Memory site.